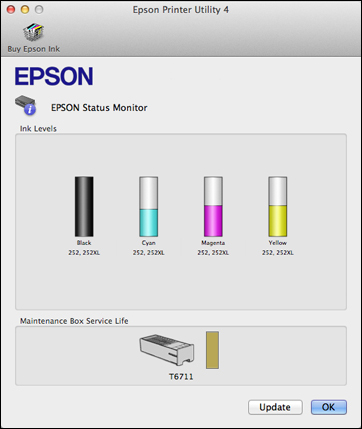 You can check the status of your ink cartridges and maintenance box using a utility on your Mac. OS X 10.6/10.7/10.8/10.9: In the Apple menu or the Dock, select System Preferences. Select Printers & Scanners, Print & Fax, or Print & Scan, select your product, and select Options & Supplies. Select Utility and select Open Printer Utility. OS X 10.5: In the Apple menu or the Dock, select System Preferences. Select Print & Fax, select your product, and select Open Print Queue. Select Utility. You can update the ink cartridge and maintenance box status by clicking Update. Replace or reinstall the maintenance box or any ink cartridge as indicated on the screen.